Dangun Wanggeom is the legendary founder and god-king of Gojoseon, the first Korean kingdom. He is said to be the “grandson of heaven” and the “son of a bear”, and to have founded the kingdom in 2333 BC. 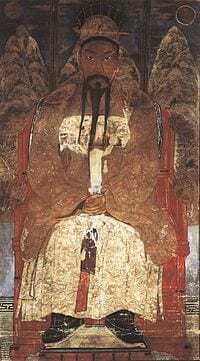 Dangun’s ancestry legend begins with his grandfather Hwanin, the “Lord of Heaven”. Hwanin had a son, Hwanung who yearned to live on the earth among the valleys and the mountains. Hwanin permitted Hwanung and 3,000 followers to descend onto Baekdu Mountain, where Hwanung founded the Sinsi (“City of God”). 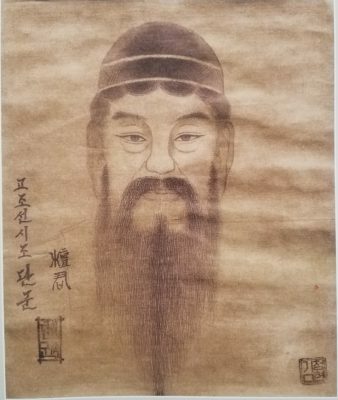 Along with his ministers of clouds, rain and wind, he instituted laws and moral codes and taught humans’ various arts, medicine, and agriculture.nLegend attributes the development of acupuncture and moxibustion to Dangun. 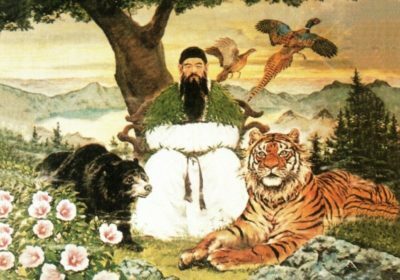 The bear-woman Ungnyeo was grateful and made offerings to Hwanung. However, she lacked a husband, and soon became sad and prayed beneath a “divine birch” tree to be blessed with a child. Hwanung, moved by her prayers, took her for his wife and soon she gave birth to a son named Dangun Wanggeom. Interestingly when General Choi Hong Hi created the Dangun Chang Hon Hyung(Form) pattern he did something that was unusual for a Hyeong. All the punches in Dan Gun are high section (eye level) symbolizing Dangun scaling a mountain.